This is the text of a speech given by Sylvia Asquith on 27th September 2017 at the Foundation of Art and Creative Technology (FACT) during the New Observatory Exhibition. Sylvia’s speech was followed by the screening of a short film by Yu-Chen Wang entitled “I wish to communicate with you”. My name is Sylvia Asquith and I joined the Bidston Observatory staff in February 1947 as Sylvia Brooks. It was a long time ago but I well remember those early days. I was employed as a junior member of staff comprising six women and two men – Dr Doodson and Dr Corkan. As well as learning to be a meteorological observer I was introduced to two ammazing tide predicting machines! These were kept running continuously from 9 a.m. to 6.30 p.m. (4.30 to 6.30 being overtime) at 2 shillings and 6 pence per hour which is 12½ pence per hour in current money, except that we do not even have ½pence any more. The minimum wage obviously did not exist in those days! During the wartime years the male members of staff were enlisted in the armed forces while the women gallantly went on with the work which was so vital at that time. They also did fire-watching on the roof and could tackle incendiary bombs very efficiently. The Roberts-Légé machine was moved to a purpose-built underground room in the grounds and kept running from there as protection in case the Observatory was bombed. The Kelvin machine was already kept in a cellar. There were incidents of bombs falling on the roof and on the hill generally and on one occasion a landmine landed near the building causing windows to be blown out but without causing significant damage. After the war Dr Rossiter and two female staff were demobbed and returned to their duties at the Observatory. After joining in 1947, I received instruction on running a tidal machine, stopping at the correct moment and reading off the time showing at the zero point, and noting down high and low waters in succession. Times done first and the high and low to correspond. Also, you need to check the data when taking over from someone else in case they had got it a day out. 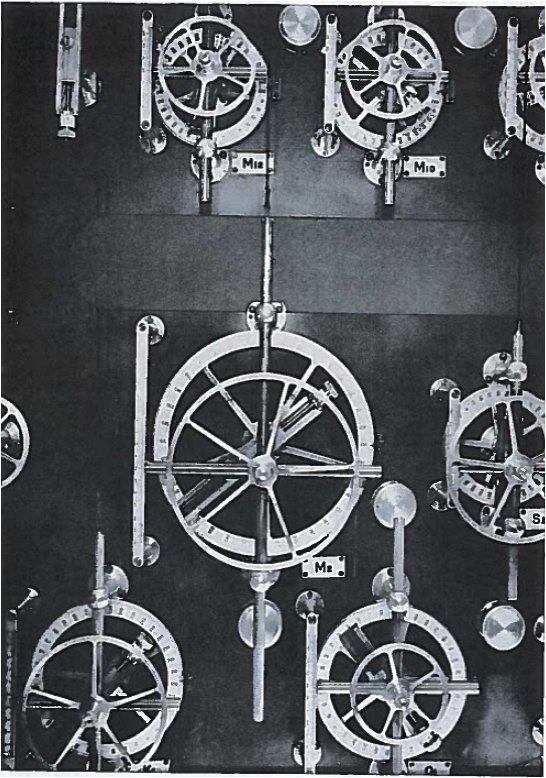 All the wheels and pulleys are connected by a fine gold wire and represent forces of the moon and sun on the tide. 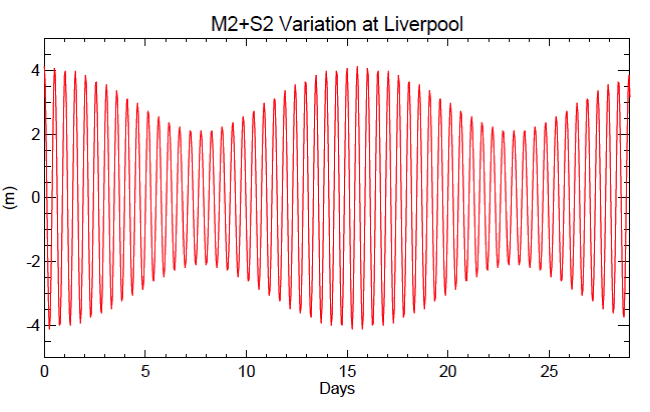 As the biggest influence on the tide is the moon, that is represented by the largest wheel, “M2”, which has the largest amplitude on it. The names denote George Darwin, a relation of Charles, who was first to devise the method of harmonic analysis. The “M” and the letters nearest to it alphabetically refer to the Moon and similarly “S” to the Sun. The “2” means twice, etc. The machines were stripped down and cleaned regularly by the three Doctors. However, one day they were away on business in London and the belt snapped! Someone remembered that bootlaces sewn together and carefully measured would be a good standby, so a staff member rushed to the shops and came back with laces and with a sewing machine supplied by Mrs Doodson from the house, and a new belt was made. Fitting was a bit tricky but we managed and the work was able to continue. The returning staff were most impressed by the ingenuity of their colleagues. 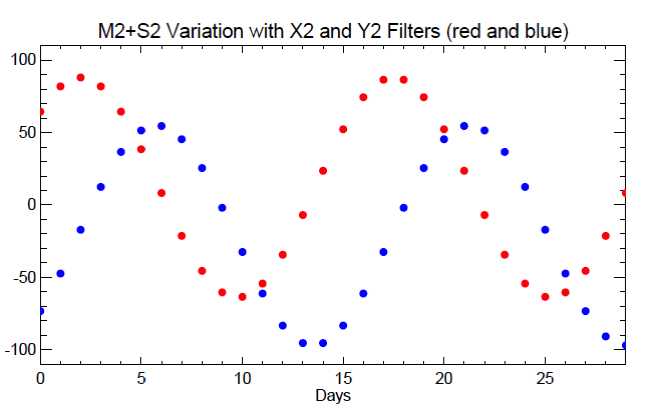 Returning to the process… The predictions came off the machine and the sequences were differenced and the differences smoothed by a senior staff member. The smoothed predictions were then typed up for publication in the Admiralty Tide Tables and photograph copies made of the originals. Yes, we even had a photographic studio and print room on site. We always tried to work two years in advance to allow for the checking and printing of predictions. 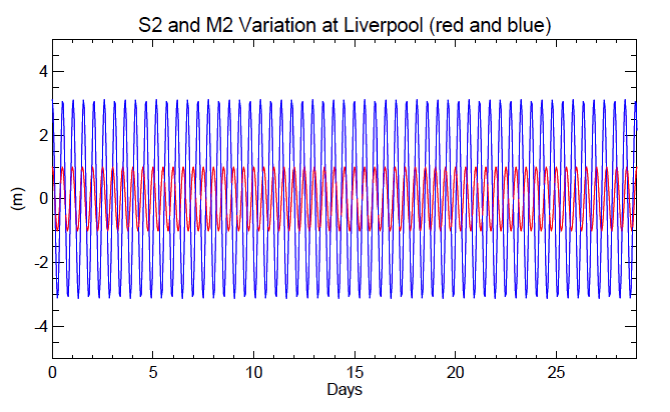 For all tidal predictions a tidal analysis is required using twelve months of actual height values and following the completion of this any year can be put onto the machine going as far back or as far forward as desired. 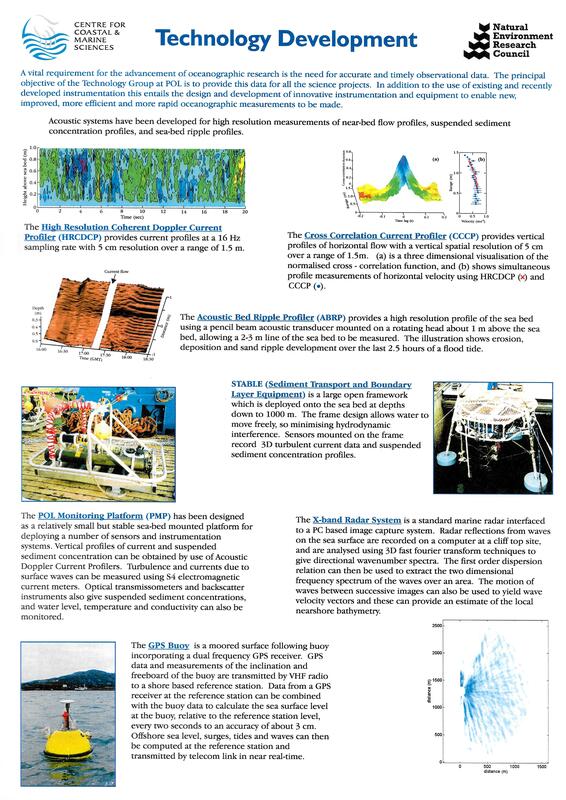 That means that, provided we know the exact date in history for an event, we could identify the tidal conditions existing at that time. Bidston was also a Met Office recording station and I was put in charge of the observers. I’m proud to say that we received two awards for our Met returns to London, indicating the very high standards, consistency and quality of our recording and reporting. 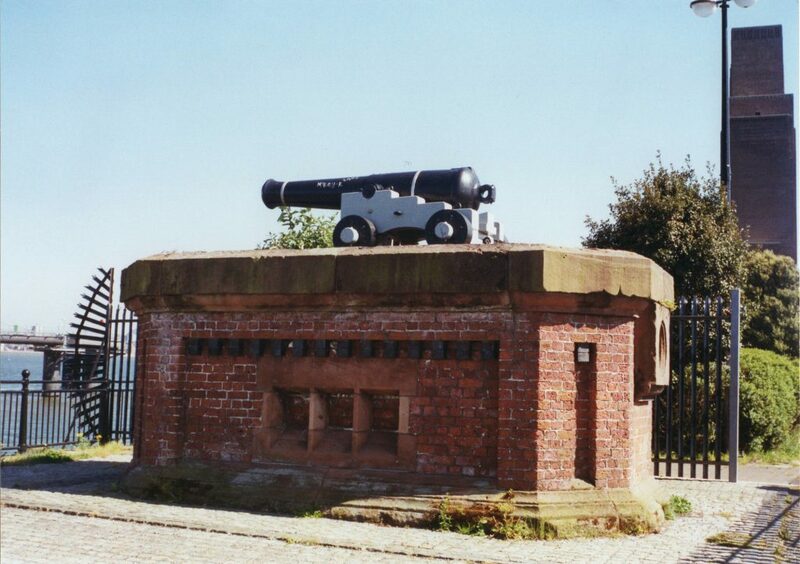 The one o’clock gun was a feature of the Observatory dating back to Victorian times giving an absolute and accurate timing to enable chronometers for shipping and people and businesses across Merseyside to set their own timepieces by. This was resumed in 1946 and fired electronically every day from Bidston to the gun at Morpeth Dock. Eventually this finished on July 18th 1969 and I had the pleasure of being the last person to fire the gun. I returned part time in 1967 after ten years working from home – not so much of a modern concept as you may have thought – and continued as a Scientific Officer until retirement in 1990. Yes, I saw many changes in my 43 years association with Bidston, from a staff of 8 to a staff of 80 housed in two buildings. Today computerisation means that predictions now take microseconds where at the start using these machines they took about three days per port, but we are talking pre-computer times and these machines represented the height of technology in their own era and as such deserve their place in history. I hope that I have given you a flavour of the history and use of these machines and the fantastic team that I worked with to operate them. We should always remember that the outputs from these machines were used by individuals and organisations across the world who depended totally on their accuracy to help ensure safey at sea and around coastlines. Thank you for listening and I hope that you enjoy the film. I only met Kazuo Ishiguro’s father once. 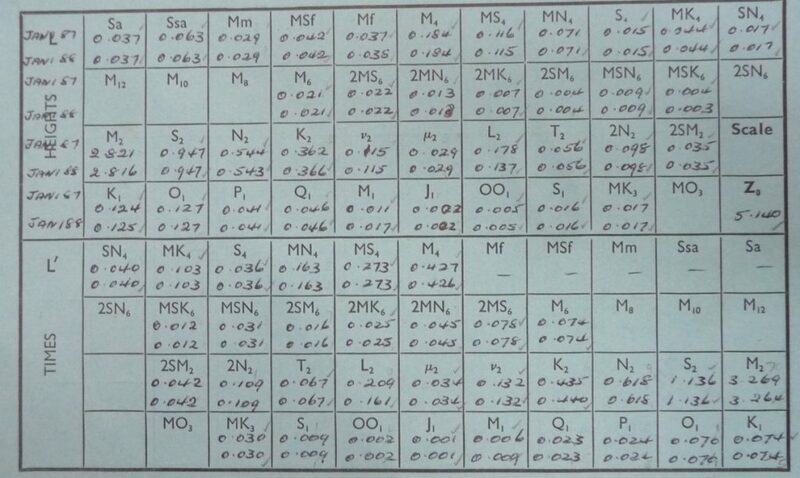 In April 1981 we both attended a session of the 5th UK Geophysical Assembly at the University of Cambridge. 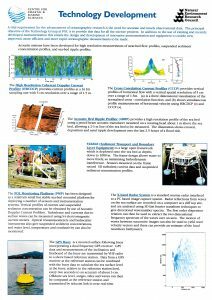 I was in the throes of my PhD study and looking at the effect of wind gustiness on wind-driven currents in numerical models. In our session, on “Air-Sea Interaction” there were only three of us (the third being Ed Monahan, who worked on wind waves), and being the last session on the Friday afternoon, and rather peripheral to the main topics of the conference, there were only the three of us left there to listen to each other’s presentations and dutifully ask questions. Shizuo Ishiguro’s talk was entitled “Extreme surge predictions by the quasi uniform steady wind/pressure field method” (*); he was known to me by reputation, although by this time his work was something of an anachronism, as the world had moved on to digital computers. He had built an analogue computer to model North Sea storm surges and was employed, like myself, at the Institute of Oceanographic Sciences (IOS), but based at Wormley in Surrey, while I worked at Bidston Observatory in NW England. 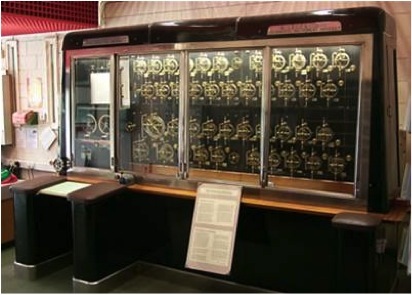 His storm surge calculator was an electronic analogue computer, originally developed at the Marine Observatory in Nagasaki, Japan for applications in the fishing industry. In 1957 he came to England, at the invitation of George Deacon, the Director of National Institute of Oceanography (the precursor of IOS Wormley) in Wormley after they met at a tsunami conference in Japan. 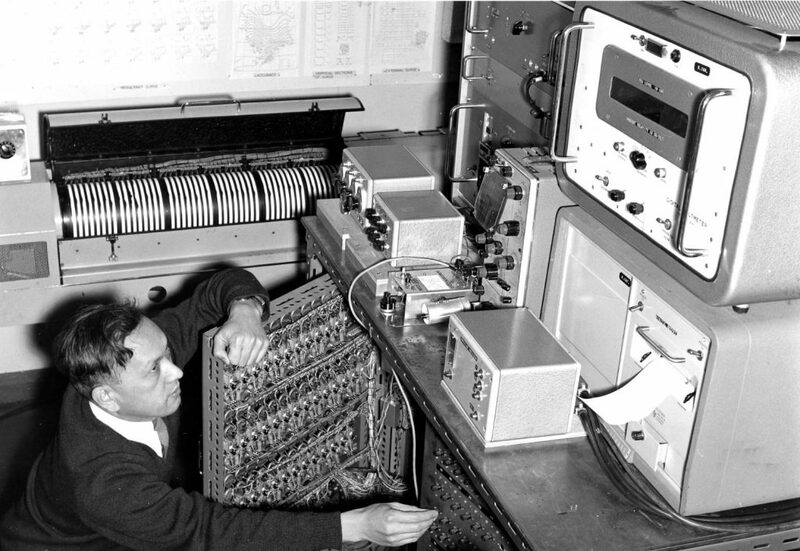 Initially he was on a UNESCO fellowship, then joined the permanent staff in 1959 as an “oceanography engineer” and developed his machine to model North Sea storm surges. 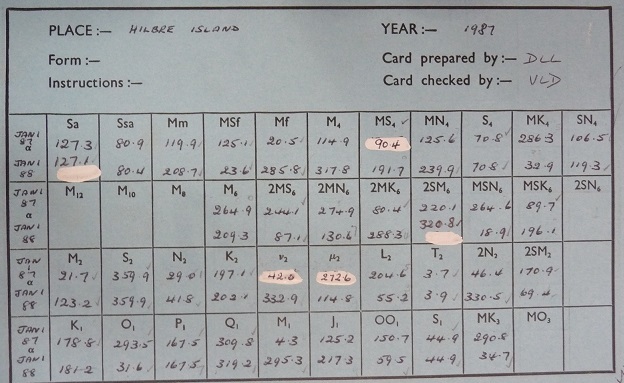 The calculator converted hydrographic and meteorological data into voltages and electric currents and produced output on an oscilloscope relating to the behaviour of the surge wave at coastal locations. Shizuo Ishiguro and his storm surge modelling machine. (c) National Oceanography Centre. When he retired he took the calculating machine home and tinkered with it in his shed until his death in 2007. It is now in the mathematical collection, the Winton Gallery, in the Science Museum in London, which I visited on 1 January 2017, seeing the machine at first hand, for the first time. Shizuo’s son, Kazuo Ishiguro, was born in Nagasaki in 1954, but moved with his family to the UK, as a boy. He has said that if he hadn’t moved to the UK he might never have become a writer. 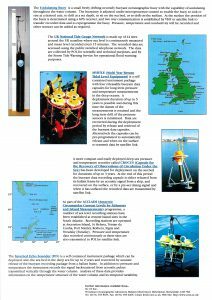 * For more information, see http://journal.sciencemuseum.org.uk/browse/issue-06/understanding-storm-surges/.